By Wednesday, our small family group expanded to include Dear SIL’s parents and brother and we all went off to the Vancouver Aquarium because dear daughter wanted to touch the stingrays. That is an odd goal that she has … to visit stingray tanks in as many zoos and aquariums as possible. So far she has Vancouver, Tacoma, Chicago, LA and Galveston, TX. The Vancouver Aquarium is justifiably internationally famous and some of our visit highlights included the jellyfish, the otters and seals (so playful), the educational shows, the frogs and that I got to be there when the penguins were delivered back to their habitat. Afterwards we went to see the Totem Poles, which are also in Stanley Park. Interesting facts about totem poles can be found here. This entry was posted in British Columbia, Canada, Community Space, Museums, Non Profits, Parks, Vancouver and tagged Aquarium, British Columbia, jelly fish, penguins, Stanley Park, totem pole, Totem Poles, Vancouver, view on July 3, 2017 by admin. Dear daughter and I went to revisit the Himalayan Blue Poppies at the Weyerhaeuser Rhododendron Gardens in Federal Way before they completely faded away for the season. In the United States, these poppies only grow in parts of New England, the Pacific Northwest and Alaska, so we are lucky. While we were they we checked out the adjoining Pacific Bonsai Museum, which we had been through a half dozen times. This time though there was a really great exhibit titled Natives. Per the brochure “each display in Natives is a composition of four artists — the bonsai artists, the kusamono artist (Young Choe), the ceramicist (Victoria Chamberlain) and the visual artist (Iuna Tinta)”. In case you don’t know (I didn’t) a kusamono artist creates potted arrangements of wild grasses and flowers in unique pots or trays. So each display has a bonsai, a companion kusamono (accent), the ceramic art (often using minerals from the depicted region) and a visual piece of art, all of which are centered around a particular place. It is a marvelous exhibit and worth some real time. The exhibit runs from April 8- October 8, 2017 and more information can be found here. And, of course, there are some photos of the blue poppies and other foliage from the gardens. This entry was posted in Art -- there is art here!, Farms and Gardens, Federal Way, Museums, Non Profits, WA State - King County and tagged accents, art, Blue Poppies, Blue Poppy, bonsai, exhibit, Federal Way, gardens, Himalayan Blue Poppies, Iuna Tinta, Kusamono, Natives, Pacific Bonsai Museum, rhododendrom, Weyerhaeuser, Weyerhaeuser Rhododendron Gardens on June 11, 2017 by admin. Dear Daughter, home for her last Thanksgiving Break, needed to visit Mt. Rainier as part of her geology class. OK, fine, I like Mt. Rainier. I pack up my emergency backpack, extra blankets, water in case we hit bad weather and dear husband and off we went. Luckily there are many pullouts from the street near the mountain and DD got her photos. Not the full glorious mountain, of course, because it was raining and even snowing, but some close ups of rocks that seemed to make her happy. We got as far as Longmire and had lunch and checked out the small museum (the Longmire Museum at Mt. Rainier). I was so busy staring at the vicious face on this little weasel that I didn’t notice his poor prey until I reexamined the photo! So here are the photos. Beside the Longmire Museum there are two shots of the Mountain taken on clearer days, a photo of the road going through the National Park, the porch at the lodge and the graffiti rocks approaching the park. BTW, you need to have chains in your vehicle to enter the park after November 1st. It gets dark at about 3 pm in the winter (its all those trees!). There is no cell service on the mountain (at least the part we were at). Here is a link to Longmire. And Happy Thanksgiving. This entry was posted in Ashford & Mt. Rainier, Museums, Parks, WA State - Pierce County and tagged animals, chipmunk, cold, Longmire, Mt. Rainier, museum, snow, Thanksgiving, trees, weasel, woodpecker on November 24, 2016 by admin. In the early 1920s, during the presidency of Harding, our country was subject to the Teapot Dome Scandal, which revolved around oil reserves that were leased without competitive bid. There were two oil fields involved, the Teapot Dome fields in Wyoming and the Elk Hills field in California. The leases were investigated by the Senate and criminal charges were filed. Fines were paid, jail time served and the phrase Teapot Dome became synonymous with political corruption. Well, in 1922, in the middle of the scandal, Jack Ainsworth, constructed his Teapot Dome Gas Station as a nod to the scandal. It is considered a roadside attraction and is open for visiting on the weekend for limited hours. Originally it was situated on Highway 410 between Zillah and Granger; however in 1978 it was scheduled to be moved to make way for Highway 82. Five days before it was to be moved, a car plowed into this tiny structure. The building, which is now on the historic register, was reconstructed by hand and moved to its current location at 14691 Yakima Valley Highway. It has its own parking lot, a public restroom building and is next to a memorial for fallen firefighters. I got there about five minutes before it closed (I didn’t even think it might be open!) and got the tour (about 2 minutes). The volunteers were delightful. I read that there is a movement to relocate the building once again to downtown Zillah and to have it function as a visitor’s center. I was glad to have a chance to see the quirky building, though the light made it difficult to capture the image. This entry was posted in Historic Sites, Museums, National Historic Register, WA State - Yakima County, Zillah and tagged firefighters, gas, Harding, President Harding, quirky, Roadside Attraction, scandal, Tea Pot Dome Gas Station, Teapot Dome Gas Station, Yakima County, Zillah on August 25, 2016 by admin. Stopped by the Tacoma Art Museum today to catch the Edvard Munch and the Sea exhibit before it slipped away on 7/17/16. While that was terrific and I learned a bunch about Munch, what I really loved was the Northwest Art Now Exhibit. There are some excellent, thought provoking pieces in that exhibit, included one of my favorites “Just be your selfie” by Dylan Neuwirth. I was at TAM on a brilliantly sunny day and this outside piece was difficult to see, so I did highlight it in blue in the photo (look at me learning Photoshop!) I need to go back in the evening to capture it glowing. More information on the Seattle based artist can be found here. Below is the photo without my added blue box, Richard Rhodes’ untitled “stone wave” sculpture and a shot of the gallery (again playing with Photoshop). This entry was posted in Art -- there is art here!, Museums, Tacoma, WA State - Pierce County and tagged Dylan Neuwirth, Edvard Munch, Edvard Munch and the Sea, Just be your selfie, neon, Northwest Art Now, stone wave, Tacoma, Tacoma Art Museum, TAM on July 3, 2016 by admin. 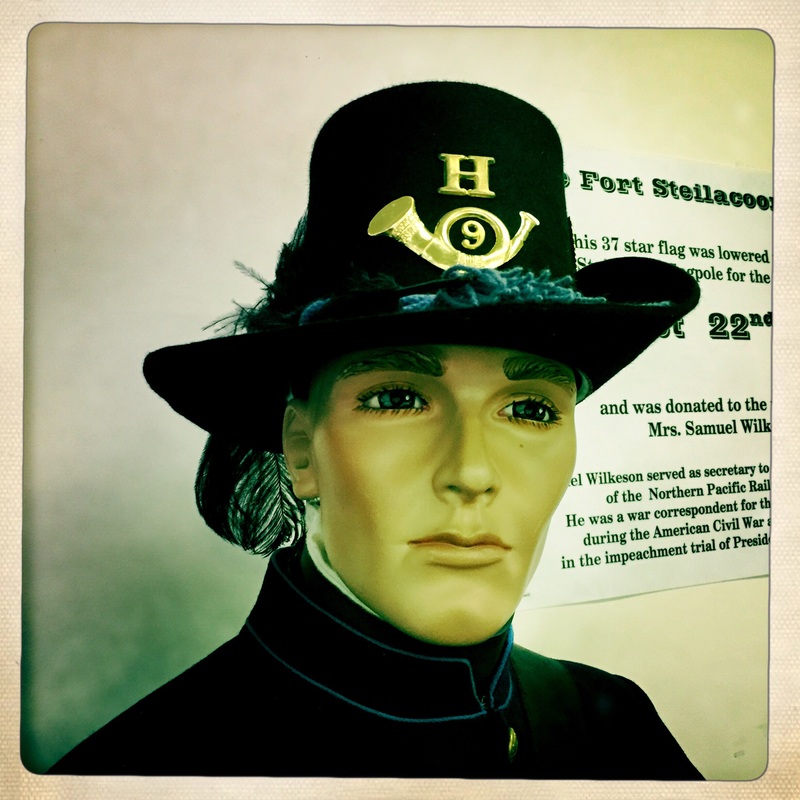 For a year we planned to visit Historic Fort Steilacoom at 9601 Steilacoom Blvd, Lakewood, but they have limited hours (Sundays 1-4 during the summer and the first Sunday of the month from 1-4 from Labor Day to Memorial Day), and we have three different schedules, so it just took that long. We thought it would be a small museum and perhaps it might be about Western State Hospital, but we were wrong on both accounts. The museum included several buildings and a two hour tour and was completely about the historic fort which had operated on the grounds. The tour guide was so incredibly knowledgeable and explained the fort’s history using the detailed model and in the other buildings to illustrate to us how the soldiers lived. I found it particularly interesting that the army would send representatives back east to meet new immigrants at the docks. The men would be offered transportation to the west coast and a job with room and board. Some eventually received free land. Such an opportunity. The fort’s history can be found on their website, but it is worthwhile to visit in person and go inside the actual buildings and talk to the terrific volunteers. Talking about the volunteers, the green tint on the two gentleman is completely the fault of the lens! I was told that the lack of smiles is because people didn’t smile for photos in those days. They thought it made them look imbecilic. This entry was posted in Historic Sites, Lakewood, Museums, WA State - Pierce County and tagged canon, Fort, Fort Steilacoom, historic, history, imbecilic, immigrants, Lakewood, soldier, soldiers, volunteers, Western State on August 31, 2015 by admin. 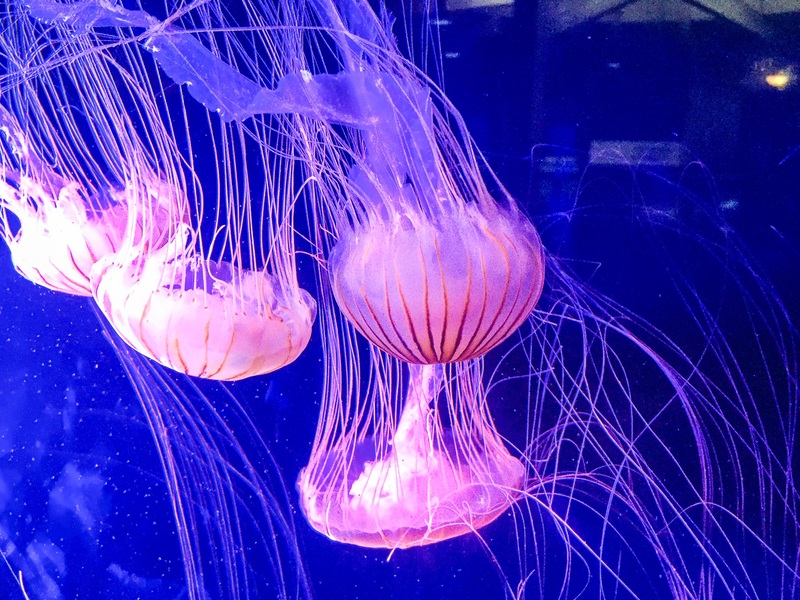 Squeezing in a little last bite of summer, a bunch of us went to to the Point Defiance Zoo and Aquarium to visit the jellies and the big cats. It was such a treat because one of the group of our happy group actually volunteers at the zoo and was able to tell us about the animals. I was so busy chatting with my friends, that I forgot to take many photos! Perhaps the dearest of the exhibits was the cloud leopards cubs even though they just slept there in a big pile of darlingness. This entry was posted in Museums, Non Profits, Tacoma, WA State - Pierce County and tagged Aquarium, cloud leopards, field trip, Point Defiance, sea horses, Tacoma, tigers, zoo on August 30, 2015 by admin.